As a salon owner, you are consistently looking for new, cost-effective ways to market your business and connect with customers more effectively. Day by day, the social media space is becoming increasingly more confusing and time consuming; and the cost of traditional advertising continues to rise leaving you to seek out marketing solutions that are inexpensive but effective. Although often overlooked by salon professionals as a viable marketing tool, e-mail marketing could be the answer for owners seeking to engage current customers and attract new ones. A lucrative and measurable form of marketing, e-mail marketing gives salon owners the ability to communicate various types of customized information to clients with minimal investment of time and effort. Updates on treatments, services, or products new to your salon. Unlike other forms of marketing, e-mail marketing makes it easy to send personalized messages to segmented lists in your database. List segmentation is grouping recipients of your e-mails into sub-categories based on interests or demographics. Segmenting your list and choosing relevant content that interests your recipients helps to maximize open rates and increase the number of clicks. For example, if your salon offers various services (nail art, acrylic services, pedicures), you can divide your list to include only those clients who receive that particular service. Segmenting not only allows you to send unique, targeted e-mails to different client lists, but it makes it simple to send relevant content to customers who will benefit from the information the most. E-mail marketing is one of the best ways to help grow your business, promote products and services, increase your client base and stay in touch with your customers. Learning how to develop and implement an effective e-mail marketing campaign is essential to your overall success. First you will want to decide what e-mail service you plan to use. For small businesses, some of the more widely used e-mail marketing services include Constant Contact, MailChimp, and iContact. In some instances, these and other services offer free accounts or trial periods for businesses with less than 500 recipients in their databases. If you have more than 500 contacts, plans for these services start at $10 and can range up to $35 or more per month. Included in your subscription, these services provide a variety of templates and allow you to add your own photos, logos, and graphics. Once you sign up for a service, familiarize yourself with its features and tools and begin to strategize how you will proceed with your campaign. To gain ideas, sign up for e-newsletters and join mailing lists of other salons to study how they execute their own campaigns. Pay attention to the frequency of e-mails sent, templates used, times of day they send, the overall look and what types of information they include. Write a plan for your campaign and make note of what you like and dislike so you can add or avoid these things in your own campaign. Per dollar investment, e-mail marketing offers the highest return on investment (ROI) when compared to paid search, web banners, or social media. 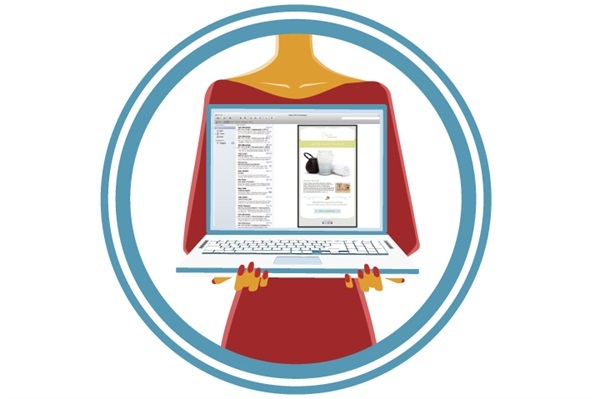 “The ROI is $43 for every $1 salon owners invest in e-mail marketing,” Cates says. That means for every dollar you invest in your e-mail marketing campaign, your return is $43, which is pretty incredible. Cates says e-mail marketing works so well for heavily referral-based businesses like salons and spas because it is perceived more as a relationship. It is easy and accessible and is the preferred method of communication for the receiver. Additionally, because you have more control over your content and delivery, you have the ability to customize messaging to your various segments. E-mail marketing campaigns can complement any marketing effort. When used effectively, e-mail marketing is one of the best ways to grow salon business, because it keeps the salon in touch with its customers, and it helps to build brand loyalty and client awareness. E-mail marketing is a “best kept secret” that few salon professionals think about as they create marketing plans to build and sustain business. It is a great option to consider adding to your marketing mix because of its ease of use and personalization capabilities. Building e-mail marketing campaigns take some time and there will be a lot of trial and error while you figure out what works for you and your salon. Here are five best practice points to consider as youbuild your campaigns. 1. Getting clients to opt-in. When you decide to launch your e-mail marketing campaign, you will want to consider how you are going to entice clients and potential clients to opt in. Clients will need to sign up or opt in to receive your e-mails. You should ask your clients to opt in when they are making appointments or include sign-up widgets on your website and in your e-mails. You should also encourage your clients to forward your communications to friends. Due to anti-spam laws, it is important to be clear and let your clients know what they are signing up for and that they will be receiving e-mail communication from you. 2. Keep it simple. Make your communications easy to read and make sure you are sending relevant content to the right audience. Don’t overdesign your templates by adding lots of photos or graphics. Remember less is more! 3. Segment your lists. The more you send information that matters to the right audiences, the more your clients will learn to trust and appreciate what comes in their inboxes from you. Segmenting makes it easy to send to and produce creative ideas to market to your clients. 4. Think about your subject lines and make “from” lines clear. 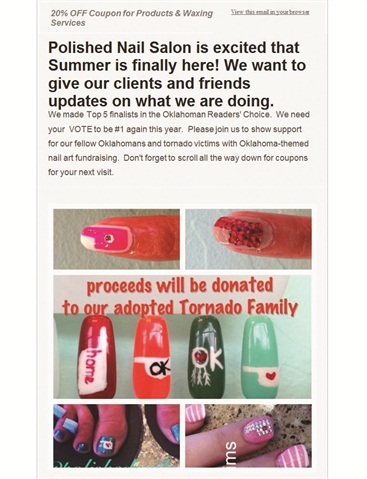 When sending e-mails be sure that it is apparent that you or your salon is sending the message. Your clients should never have to guess who is sending them an e-mail. If they have to guess, then they will lose interest and not open your e-mails. Cates says, 60% of all recipients decide to open an e-mail based on the “from” line, and 30% decide based on the subject line. Subject lines should be 40 characters or less and be straight to the point but catchy. Ideally, you want the receiver to be able to read the entire subject line in the preview. 5. Always consider your audience. Never come across as being too “salesy” in your e-mail, but instead offer solutions to your client’s problems or educate them on a topic. You are the expert on the information you are sending. Share intellectual content with your audience. Incorporating e-mail into your salon marketing plan can boost overall sales and increase customer engagement at a low overhead cost. Now that you have considered all the great benefits of e-mail marketing, maybe it’s time for you to opt in. Tiffani Douglas is a licensed nail technician and marketing professional with a passion for the beauty industry. Her goal is to help beauty professionals discover new frontiers in the beauty business. She is the author of “Social Media Marketing: A Guide for Beauty Professionals” and beauty blogger for Tiffani’s Beauty Parlor.